As of January 1936 Albert Balch and Ralph Jones were on their way: they had started a new real estate development called View Ridge and had been able to get some buyers. Although Balch & Jones had experience in advertising and communications (newspapers and radio) neither had training or experience in real estate and construction. The two men launched out on an incredible adventure, especially considering the dark days of the 1930s economy called the Great Depression. It was audacious for the men to quit their jobs and go into real estate full-time; one wonders whether they told their wives what they were going to do! Balch & Jones boldly set out to jump-start the Seattle real estate market which was at a standstill in the 1930s. The View Ridge development is on a steep eastern-facing slope looking to Lake Washington. This photo taken in 1966 looks down the hill of NE 70th Street from about 56th Ave NE toward the Sand Point Naval Station on Lake Washington. Photo courtesy of Seattle Municipal Archives Item number 177131. When Franklin D. Roosevelt won the election of President of the United States in November 1932, the Democrat Party also swept the elections at other levels. There had been twelve years of Republican administration at the federal level, and similarly in Washington State there had been Republican governors and administrations. As of the beginning of administrations in January 1933, political appointees in King County, such as the Auditor’s Office, were of the Democrat Party along with new Governor of the State of Washington Clarence D. Martin and President of the United States Franklin D. Roosevelt. The December 1935 news articles of Balch & Jones plat filing noted that View Ridge was the first plat filed in King County in more than two years “since the present administration has been in office” meaning that the King County Auditors office had not seen any plat filings in the time they had worked there. While some houses were built in Seattle and in King County during the early 1930s, what was meant by “the first plat” was that no one had filed notice of intent to lay out a plan for a group of house lots in any undeveloped new areas since 1933. By “the present administration” it was meant that since elections of 1932 when there was a change in the political parties which were in power, the personnel in the King County Auditor’s office had not seen a new plat filed. The Seattle Daily Times of December 8, 1935, page 27, ran this photo of Balch & Jones at the King County Auditor’s office, filing the documents for the View Ridge subdivision. The property, originally covered with a heavy growth of small timber has been more than 50 per cent slashed and cleared, while streets and alleys have been cut through and forty-eight lots staked out. Several lots have been sold and construction of residences will start soon. The entire tract affords a sweeping view of Lake Washington and the Cascades. The contour is such that every house will have an unobstructed view, as the land slopes well toward the east. Crews from the county engineer’s office and from the Public Works Administration have completed the widening and graveling of 50th Ave NE, have cut through the depth of the property for NE 68th Street and have cut through and cleared space for 51st Ave NE and the alley between 50th Ave NE and 51st Ave NE. Balch & Jones learned the construction, development and real estate businesses literally from the ground up in View Ridge. They first arranged to clear some of the ground, cutting down all of the trees to expose the views of Lake Washington, so that they could sell lots to potential residents. 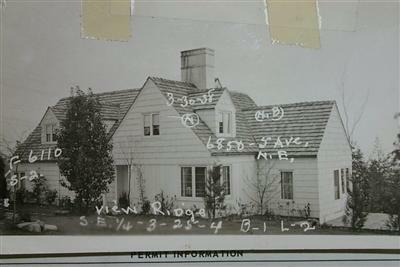 Balch and Jones submitted a drawing of the first house to be built in View Ridge to the newspaper in November 1935 (pictured below), as a way of indicating that the new development was making progress. Not until December did Balch and Jones bring in the official plat filing (described above) for a layout of streets and lots. Although done slightly in backwards order, starting to sell lots first and then filing a plat later, it was not illegal. The Seattle Daily Times, November 3, 1935, page 23, printed this photo and caption about the start of construction in the new View Ridge development. In the first year of the project, Balch & Jones sent in a barrage of publicity notices to the newspapers which were eager for some good news during the bleak years of the 1930s. Next Balch & Jones began to line up the team of architects, engineers and construction companies who would help them develop View Ridge. The plat had surveyed by an engineering firm and the plan of the layout of lots and streets was accepted by King County. Then some work began to be done for putting in streets. The View Ridge lots were on a steep slope, so a kind of terracing had to be done to make the streets like steps on the side of the hill. Although I don’t have documentation of this, it was told to me by neighborhood residents that Balch, who always looked to hire local people, hired men with horse-drawn scoop shovels to grade the first streets in View Ridge. 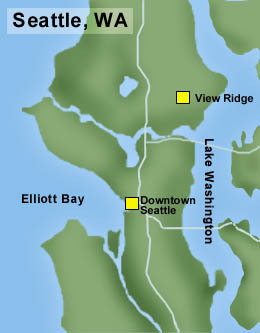 Since the View Ridge development was outside of the Seattle City limits, there were problems regarding utilities. Each house had to be on a septic system because there were no sewers, and Balch & Jones had to arrange for water lines to be put in. They found that business was slow for electric companies City Light and Puget Power so the two competed with one another. At first there were two sets of electric poles and lines in View Ridge, as some homeowners chose one company and some another. As is typical of houses in the Pacific Northwest Modernist style, this 1958 View Ridge house by architect Wendell Lovett has an unpretentious front entry. The house opens up in the back with a wall of windows looking out over Lake Washington. The address is 7520 57th Place NE. October 20, 1935, Winter Building Plans are Made: View Ridge, that new colony being developed for young married couples, is squaring off for a winter building program which is expected to lead the Seattle construction activity predicted on every hand to get well under way by next spring. This new subdivision, which four months ago was an unimpressive tract of land on the crest of the ridge between Laurelhurst and the Sand Point Golf Club, has advanced today so that it is one of the show places of Seattle. Clearing and road work have converted this spot into one of the outstanding view sites of the Northwest, commanding a sweeping view of Lake Washington, the Cascades and Mount Rainier. The Stewart Construction Company plans to start excavation for the first home in the subdivision by December 1………at least two more homes will be started the first week in December and another in February. Houses will cost from $3,500 to $8,000. View Ridge is being developed by two young Seattle businessmen, Ralph Jones and Albert Balch. They have found a great demand for desirable home sites among their friends who desire to build under the conditions existing at View Ridge. The colony is restricted to compatible young couples and is being developed on a cooperative plan at prices that would have been regarded extremely low during the darkest days of the depression, when business was at a standstill. The colony is located just outside the city limits at 50th Ave NE and East 65th Street and each plot of ground always will command an unobstructed view. The View Ridge house built in 1958 at 7520 57th Place NE typifies Pacific Northwest Modernist architecture. The house “has its back turned” to the street and all emphasis is on private family spaces and a connection with the outdoors, including windows to see the view of Lake Washington, and an outdoor patio. From the above news excerpt which was written by Balch & Jones and submitted to the newspaper, we see how they promoted the View Ridge development as a new, trendy residential colony for young married couples. This strategy was probably in part due to Balch & Jones themselves being young (each was 32 years old), early in their careers and marriages. They emphasized the “desirable home sites” but there is also a subtle reference to buyers being willing to “build under the conditions existing at View Ridge.” New home buyers in View Ridge would have to be willing to live with some of the difficulties starting out, such as the utilities (lack of sewers, and the need to have electric lines put in) and the out-of-the-city location. Other difficulties not mentioned in the advertisements for View Ridge were that there was no bus service, no paved roads, no nearby stores or schools. By referring to the development as a “colony” and “restricted to compatible young couples,” Balch & Jones implied that young marrieds who were active, resourceful, and willing to live with a few inconveniences at first, would be making a good investment in homes and in long-term residence in View Ridge. Balch & Jones recruited heavily from among their fraternity brothers and other young professionals. Each time a sale was made, they arranged to have that person’s name mentioned in one of the publicity articles. Today, most people would not like to have it advertised when they made a house purchase. But in the 1930s the newspapers had a Society Page and printed lists of people who had attended charitable fundraisers, women’s programs, and weddings. People enjoyed the prestige of being mentioned in a positive way and, as they were proud and excited to have a new home in View Ridge, mention in a news item on the Real Estate Page was part of the celebration. In a 1990 interview by reporter Casey Corr, Ralph Jones stated that his own home was the fourth house to be built in View Ridge. The Jones’ house was at 6800 50th Ave NE (torn down in 2008 and since replaced by new houses.) Albert Balch’s house, also built in 1936, still stands at 6850 50th Ave NE. To their credit, Balch & Jones showed by their residence in View Ridge that they stood by the integrity of their work. Certainly if they were not planning to do a good job, they would not have come to live in the same community that they were building. Albert Balch (1903-1976) and Ralph Jones (1903-1996) lived in their View Ridge houses for the rest of their lives. The View Ridge development expanded from the original ten acres to a total of two hundred acres. Today the View Ridge area represented by its community club, is defined as the east side of 35th Avenue NE from NE 65th to 75th Streets. Continued: Albert Balch, Part Four: A New Development in Wedgwood. The Albert Balch house in View Ridge, 6850 50th Ave NE, as it looks today. “Winter Building Plans are Made.” Seattle Daily Times, October 20, 1935, page 20. “View Ridge Plan.” Seattle Daily Times, November 3, 1935, page 23. “View Ridge Tract Submits Plat for First Subdivision.” Seattle Daily Times. December 2, 1935, page 18. “First Plat Filed” (photo & caption). Seattle Daily Times, December 8, 1935, page 27. “New View Home Open to Public.” Seattle Daily Times, April 26, 1936, page 47. “A Fine Development” (interview of Ralph Jones) by O. Casey Corr, The Seattle Times, July 22, 1990, page G1. This entry was posted in Balch, Houses, Plat names and tagged 1930s real estate development, 6850 50th Ave NE, Balch house in View Ridge, Neighborhood History, Seattle, WPLongform. Bookmark the permalink.